Join us to discover the latest thinking from a range of experts on graduate recruitment and development issues and trends in our special edition download, in addition to news, analysis, polls, features, latest products from our HR shop and exclusive event discounts. Our features will be published throughout the week but, if you can’t wait until then, you can access the entire collection by downloading the special edition pdf from the Graduate Week homepage. Graduate Week is brought to you in partnership with leading HR conference and training provider, Symposium and is sponsored by recruitment specialist, Milkround. 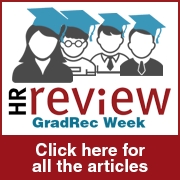 As an exclusive reward for HRreview readers, you can access your discount code for delegate passes to Symposium’s Graduate Recruitment and Development forum 2018 by visiting the Graduate Week homepage and downloading the special edition.